On April 17, 2003 recognized aquatic and terrestrial mollusk experts Harry G. Lee and Henry McCullagh conducted a survey of the molluscan fauna of what has come to be known as the Freedom Commerce Center Tract [located north of the Avenues Mall and east of Philips Highway (Route US-1)] as a prelude to a proposed controversial commercial development of the area. Among the species identified during this survey were a population of Pomacea paludosa in a small shallow creek on the property. On August 23, 2005, this scribe made a follow-up visit to the area which is located in the 9500 block of Philips Highway. 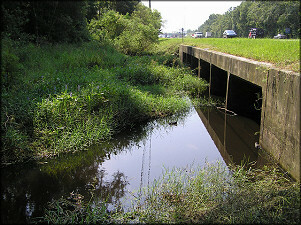 Upon arrival at the creek (upper reaches of Julington Creek) where it intersects Philips Highway, Pomacea paludosa egg clutches were evident on both low vegetation and the concrete box culvert which runs under the highway. 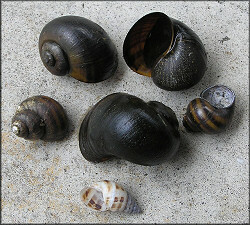 Three live specimens were soon found feeding on the ample vegetation. 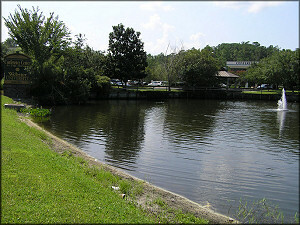 A visit was then made to a small lake/retention pond in a commercial plaza in the same general area at the intersection of Gazebo Park Place South and Philips Highway; but to the west of the highway. The shoreline was littered with dead Pomacea paludosa but no live specimens or egg clutches were found to indicate their continued presence. It appeared likely that the lake may have been treated with a herbicide which exterminated the aquatic mollusk population of which four species were seen. A more extensive investigation of the same general area was made two days later. Not only were Pomacea paludosa found upstream and downstream in the shallow creek, but also in another nearby small retention pond and a very shallow roadside ditch (two inches deep). In the case of the latter, it's amazing that the species is able to survive at all in such marginal habitat, but in addition, also apparently survive the freezing winter weather and maintain a breeding population. Egg clutches were observed on the shallow ditch periphery. The profusion of egg clusters at the retention pond [see image] indicates a very large Pomacea population is present there despite the ponds small size. 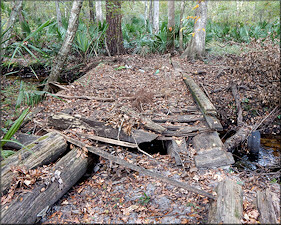 Based upon the above observations, it appears likely that many of the other impoundments/waterways in this somewhat rural and mostly undeveloped area of Duval County contain breeding populations of Pomacea.